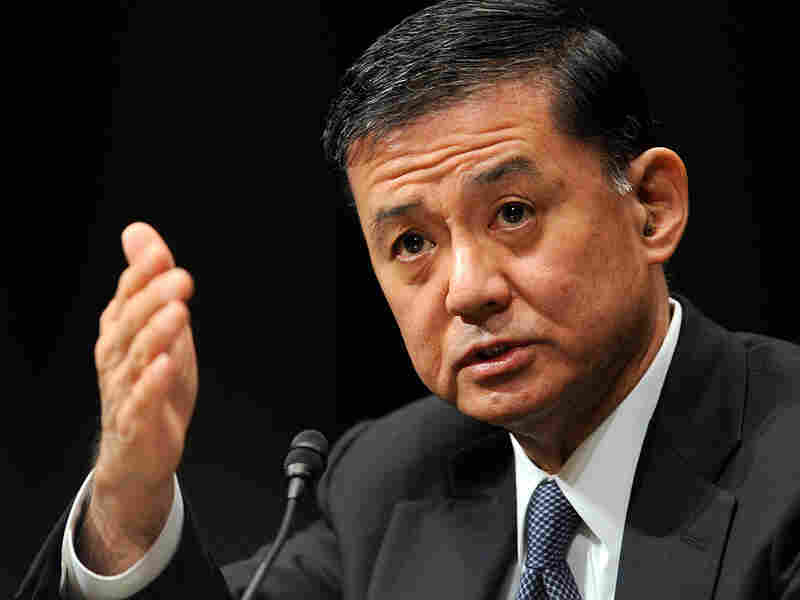 Veterans Affairs' Shinseki Answers Hard Questions Veterans Affairs Secretary Eric Shinseki, who is trying to reinvent the agency so it can meet the needs of the new veterans, sat down with NPR's Robert Siegel to talk about his efforts. Veterans Affairs Secretary Eric Shinseki says he intends to take care of the agency's big problems, such as processing claims and setting up suitable clinic settings for women. This week, NPR aired a series of reports on the new wave of veterans: men and women who have served in Iraq and Afghanistan. They have presented the Department of Veterans Affairs with new challenges: a bigger, younger clientele and more women than ever before. There are also more vets with brain trauma and more with post-traumatic stress disorder. Veterans Affairs Secretary Eric Shinseki, who is trying to reinvent his agency so it can meet the needs of the new veterans, brings impressive credentials to his office. He's a former Army Chief of Staff, the one who said we would need hundreds of thousands of troops in Iraq. He's the first American of Asian ancestry to achieve a four-star rank -- his family is Japanese-American. And he is no stranger to the problems of veterans: In Vietnam, a land mine took off part of his foot. Shinseki sat down with NPR's Robert Siegel to talk about his attempt to overhaul the VA -- and i answered some of the concerns that veterans raised earlier this week during our series, The New Veteran. Robert Siegel: In Part 1, Iraq veteran Brian Hawthorne said he has waited for two years for the VA to process his claim for PTSD. He told NPR: "We have to realize that if the VA's not your friend, who is?" How do you fix a culture so that veterans like Hawthorne just assume that the VA is their friend? Eric Shinseki: I would explain to Brian that it's more than just about friendship. This is an obligation that the nation owes those who have served. By my responsibilities, I am the one charged with ensuring that those obligations have been met. We look at this as a relationship with clients, not just customers. Customers have an opportunity to shop around and decide which choices they want to exercise. A relationship with a client is different. Clients have already invested in this relationship; our obligation is to fulfill that obligation. And so to Brian's concerns about how long it takes to process some these things: My concerns as well. It's what we've been after for the past year. Some of this has built up over time. But we intend to do something about it. The number of outstanding claims at the VA for service-related disability is around 500,000 -- and 40 percent have been waiting for four months. How do you break down the backlog? I'll accept those numbers. They seem to fall into the rough category as I recall. I would tell you that last year we processed 977,000 claims. And then received about a million new claims in turn. So this is not a case of sitting for extended periods of time. We do exceed the 125-day mark, but we move them as well. This is a big numbers game, so we have to take a bold approach to this. In the past, our approach has been more claims, hire more people. Today, we have 11,400 persons adjudicating claims. That's a significant number. We have just received authority to hire about 4,000 more people to help us in this area. At some point, we have to get beyond the brute-force approach to this. We have to get better business processes, automation in place. We have to change the relationship between VA and the veteran where they see us as advocates for them and so the level of trust is better. Because for every claim we adjudicate where the veteran feels there is a requirement to appeal the decision, that just compounds our work. In Part 2, NPR's John McChesney reported that the first encounter between the VA and the veteran is a 23-page application. It's not a symbol of advocacy. Can you do anything about that? Or is it inevitable that your first encounter is a mound of paperwork? I'm one of those who went through that process, so I have firsthand knowledge about what that means. It's not a good welcome and we intend to do something about that. We have to simplify the process and get our decisions down to what are the essential elements of information we need to adjudicate a claim at a high quality on behalf of the veteran. In Part 2, Vietnam veteran John Wood said: "It took me from 1972 to 2006 for the VA to admit that I had post-traumatic stress disorder. They were saying that I couldn't prove that I had any combat status in Vietnam, and so it couldn't possibly be post-traumatic stress disorder because I wasn't in combat, which I was." Can the VA shift the burden of proof? Much of what I bring to this responsibility is I'm part of the same generation he is and so I have a good number of friends who went through the process of trying to have some of their issues recognized. PTSD was at that time not something that was recognized. So I think that was probably widespread. And yet throughout history, PTSD has always been part of what the combat soldiers for sure, sailors, Marines, for sure, have dealt with. But as the environment of warfare has changed, there are no safe areas today as we describe them in Iraq and Afghanistan. Well, those stresses apply to more than just the combat front-line soldiers. And that's part of the adjustment here. Both to the fact that PTSD is a real issue -- and that many more are exposed at a level of stress that produces these outcomes. We are putting in place recognition of the fact that under the current operation, service in the combat zone itself can be seen as a precursor for PTSD. In Part 1, Carolyn Schapper, a California native who deployed to Iraq at the height of the insurgency in 2006, suggested a women-only counseling session. Schapper said: "A young female veteran walking through the VA is very aware of herself, cause it's mostly Vietnam veterans. All their heads turn and they're all watching you. It's very uncomfortable walking all the way to the back of the hospital to get to this clinic. Because if you have experienced military sexual trauma that's the last thing you're going to want to do." How do you respond to that? I think the active component is 14 percent -- and reserve component is as high as 17 percent. So, yes the population is changing. In 10 years, we're going to be 15 percent women. Today, we're about 5 to 6 percent. Ten years is not all that much time. So we are beginning this process. We've appointed women's program coordinators at 144 of our medical centers. They're important because they're the folks that will help us understand what programs we need to create and put into place in the next 10 years. That's everything from integrating women's health care into primary clinic areas or creating a women's free-standing clinic. The reason I give you those two offers is because we've already started this discussion and in some cases, the women at one hospital want a clinic. In other cases, they choose not to: They'd rather be integrated into the primary care just like everybody else. That's their preference; that's what we try to do so that we're not coming up with a cookie-cutter approach to everything. During the 2008 presidential election campaign, Sen. John McCain proposed that veterans be given a card to take to every center in the country to get treated. A lot of veterans didn't like that; they wanted their own discrete system. What is the future of that idea; do you assume that there will always be a discrete medical system or could there be a benefit you get which pays for your health care for the rest of your life? I would offer that there will still be major conflicts in the future of this country. It's not assured, but there is some opportunity for those kinds of concerns. And as long as we have that potential, I just think you need a health care system that's prepared to deal with the large-scale consequences of that and not find out after the fact that we've given up capabilities that were for good reason put into place after large conflicts like World War II, Korea, Vietnam. This is about meeting the obligation, as I indicated, to the veterans. And it's also a business proposition. But the obligation is an important part of this.